Silver flatware is no longer a staple of bridal wishlists. Inheriting a set of sterling silver flatware can seem like more of a burden than a benefit when you factor in the necessary polishing to keep it tarnish-free for Thanksgiving dinner. Sell your silver instead. Although there may not be as many places to go to sell silver as gold, they do exist. Of particular interest are antique silver, vintage silver items and silver flatware. Finding the right place to sell silver flatware can be difficult if you don’t know where to turn. Research the flatware. Check books and online sources that specialize in silver flatware. Write down as much information as you can. Important points to have on hand include the pattern name, manufacturer, country of origin and age. Any additional information will also be helpful. You will be in a better position to judge purchase offers or set a price if you know what you have. Examine your silver with a magnifying glass to determine if the flatware is pure or weighted silver. In most instances, this can be determined through marks on the silver itself. However, if it isn’t for some reason, keep in mind that weighted flatware generally has a visible seam around the handle. Seaming indicates that another metal makes up the center of the flatware. While many places will accept both pure and weighted silver, the amount paid for each will differ. It is, therefore, important to have an idea of the amount you can expect in both instances. Count the flatware to make certain exactly what is on hand. 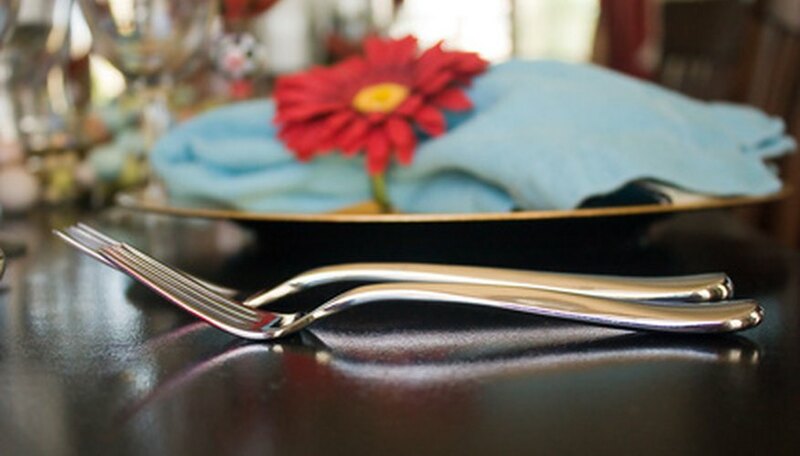 Write down the number of pieces available in every flatware type, noting any missing pieces. Also record the type and number of special serving pieces. Decide if you want to sell the flatware or if you are willing to consign it. Some sites purchase directly while others simply consign. There are some sites that do both. Consigning flatware has the potential to bring a higher price than an outright sale; however, that is dependent upon someone looking for it at the exact time it becomes available. Sell online to a purchaser who will keep the flatware intact, for instance, a private collector on an auction site, or to a company that sells flatware to individuals. These companies, like Silver Collect, sell silver, silverplate and pewter flatware as well as antique, vintage and discontinued silver items. Complete their online form in as much detail as possible and submit it. Someone from the company will respond as quickly as possible with an offer and information on how to proceed with the sale. Visit a bricks and mortar jeweler or antiques dealer. The jeweler or dealer will examine the silver on site and offer a price. Even if they don't make a purchase offer, they may be able to tell you more about your flatware. Some jewelers, like Arnold Jewelers, have online selling options as well. Contact a fine metals recycler, like Green for Gold, Cash for Silver, Cash for Silver USA or Gold Kit. Fill out the form provided on the site. Fill out their online forms and mail in the silver as directed. If accepted, payment will be sent according to specifications established by the seller. Most pieces of silver flatware are marked on the back, usually with their maker's name, whether it is plated or sterling, and on older pieces -- sometimes -- a patent date. Always follow the instructions provided by the buyer in order to ensure a safe and satisfactorily completed transaction. Check out the viability of each buyer through the Better Business Bureau and/or the Federal Trade Commission. Green for Gold: Buys bold, silver and diamonds. A business and education specialist for 30 years, Chantel Alise also owned a management and marketing training company. She has written newsletters and training manuals as well as business articles for Enid News and Eagle's Business Journal. She is principle writer for Beauty Biz. Alsie attended Thomas Nelson Community College (Virginia) and Phillips University (Oklahoma).